I slowly walked over to the aid station checkout desk. The nice lady there looked up at me. “What do you think, Jeff?” she asked. “Well, I’m stupid enough to try,” I said. I was hoping for a laugh. Instead I got a look of motherly concern that made my heart sink. “You have no color in your face,” she said. I was at mile 40 and ten hours in. Only ten miles to go, and I had time to walk to the finish. But even that wouldn’t be easy. I was in trouble – and it was my own damn fault. 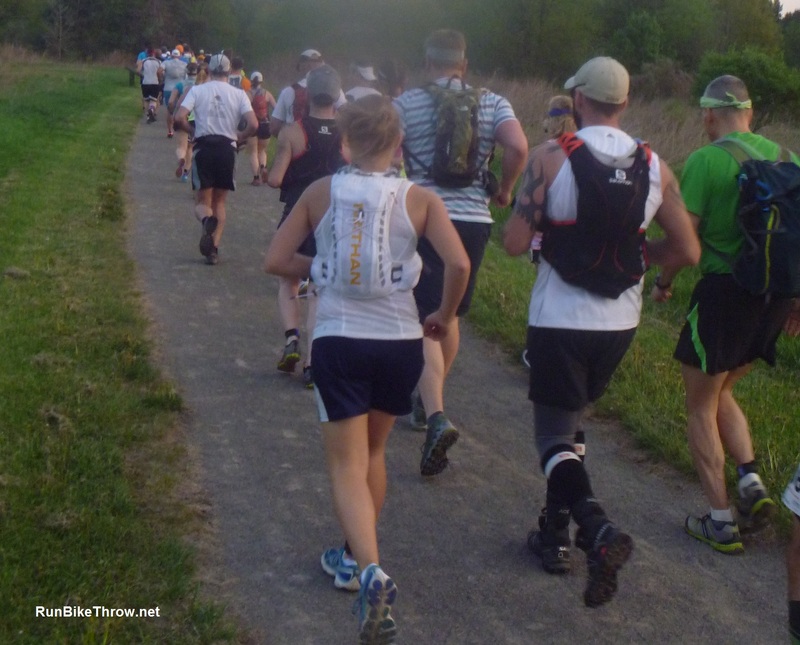 The Glacier Ridge Trail Ultra takes place at Moraine State Park near Pittsburgh, in rolling farm country. Normally held in April, the organizers were getting tired of cold temps and ankle-deep mud. So this year they moved it to May, hoping for warmer and drier conditions. Be careful what you wish for was never more true. The temperature at the 6:30 a.m. start was already in the mid-sixties and would reach 90 that afternoon. The race staff had bought lots of ice and hired extra EMT units, and told us to be careful out there. I planned to run it nice and easy, in around 11-12 hours. That wouldn’t earn any awards, but I was there to prep for an upcoming 100K, not win anything. Let the ego go, I told myself. Just finish. It was a small event, just a few hundred runners taking part in their choice of a 30K, 50K, or 50-mile individual or relay. Everyone was in good spirits as we took off, chatting about their longer races coming up later this summer. The first half of the race was awesome. My new trail shoes were performing well, the woods were filled with white and purple wildflowers, and I felt terrific. Despite two face plants (&#%@$ roots), I cruised into the Route 528 aid station at mile 21 right on pace and after a bite to eat and a water bottle refill, I headed out into the Swamp Run section. Yep, this was part of the course. Reminds me of the almond-shell hills in McFarland, USA. This 19-mile leg had long stretches of gravel road and double-wide snowmobile track. It was a nice respite from the rocks and roots of the first part, but open to the sun, which now beat down full overhead. 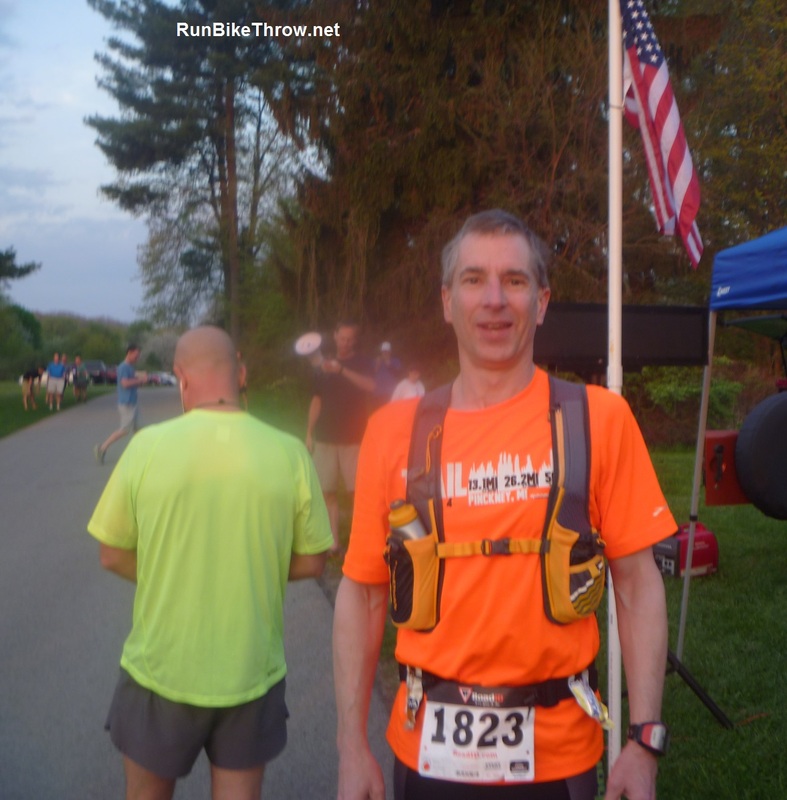 When I began to feel its effects around mile 26 I wasn’t too worried – the aid station wasn’t far away. Except it was. The Swamp Run aid station was 8 miles from Route 528, three miles farther than I had thought, and in the heat I ran short on water. I’d made a big mistake by not grabbing my second water bottle. I slowed down and finally reached the station, where the nurse there sat me down and put cold wet towels on my neck. I ate cold melon, took salt, and drank lots of water. I went on to the turnaround point, rested some more back at the aid station, and began the return feeling better. But it didn’t last; the damage had been done. Halfway back to Route 528 (around mile 36) I knew I was in trouble. I went from slow jog to walk but was still breathing hard, and wetting down my face and head was no longer helping. 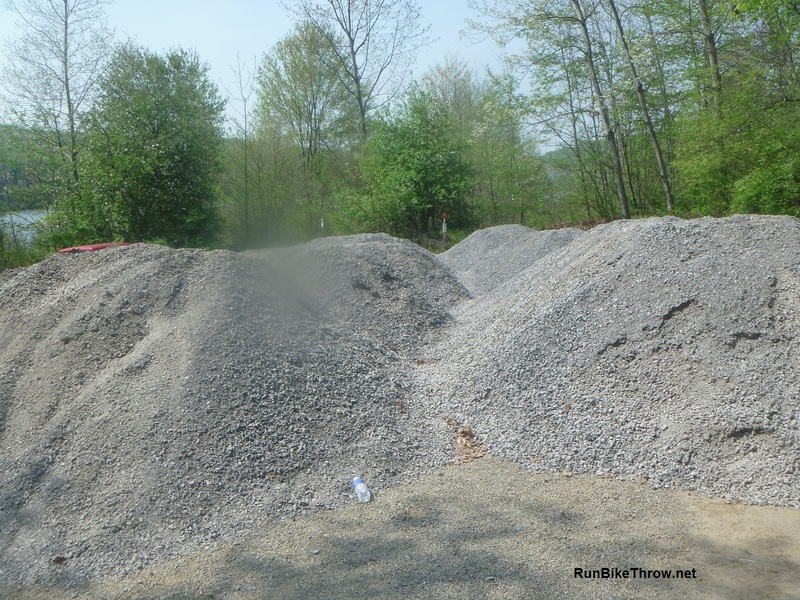 This was bad – and I was at least an hour away from the aid station. Finally I did something I’ve never done in a race; I stopped, sat down on a log, and waited. After a few minutes a group behind me came up and I joined them. Everyone was suffering from the heat and we were all grateful to see the cars and hear the voices that meant we’d reached Route 528. I sat with fluids and a large bag of ice for about half an hour, hoping I could recover enough to attempt the final ten miles. The volunteers manning the station were wonderful, making sure I had whatever I needed and checking on me frequently. All that time I debated what to do. Finally I thought I was well enough to try the finish. Until the nice lady gave me that concerned look. As a final check I used the porta-potty. What came out wasn’t much, even with all my drinking, and it looked like a strong cup of tea. That clinched it. I removed the timing strap from my ankle and handed it over. It was the hardest thing I’d done all day, but the relieved expressions told me I’d done the right thing. So I called it a day at 40 miles. My only goal had been to finish, and I hadn’t even done that. But it occurred to me that I had accomplished one thing. Ego? An attempt to finish would have soothed it. But stopping – that was truly letting it go. Up next: What I learned, and a couple of stories from people I met on the trail. I also specifically want to thank Dan and J.R. for their help during the race. Details next time. 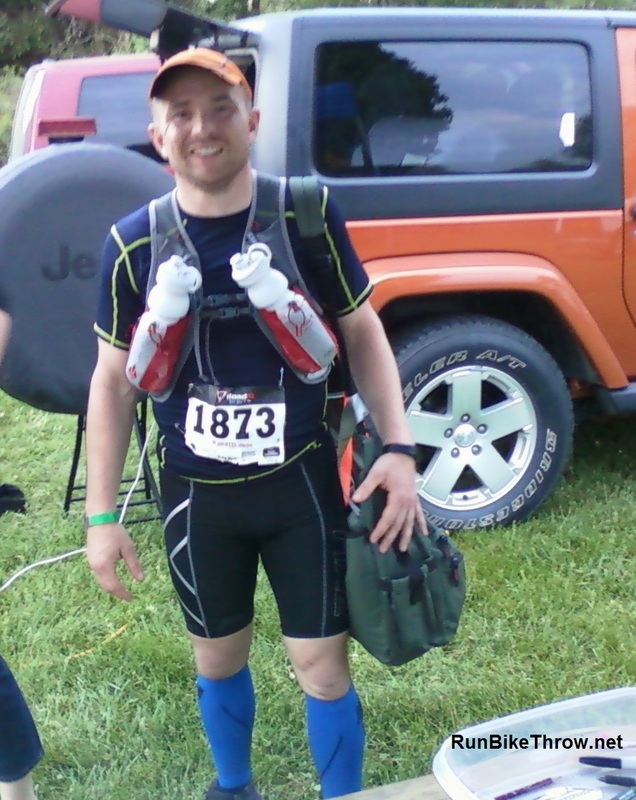 This entry was posted in Running & Cycling and tagged 50, DNF, ego, fitness, Glacier Ridge Trail, Moraine State Park, Running, ultramarathon. Bookmark the permalink.